Imagine driving in the early 1900s. Drivers relied on hand signals and shouts, plus a little bit of guesswork, to predict the actions of other cars on the road. Thanks to modern rear-lighting solutions, drivers can better predict the actions of other drivers in all environments, making driving safer. We’ve advanced from kerosene lamps to incandescent light bulbs to the more reliable and efficient LEDs and organic LEDs. As technologies advance, so too have the number of light sources in vehicles – from a single bulb to multiple pixelated designs. Figure 1 offers some examples. As rear-lighting systems become more complex, designers must consider a number of design challenges, from power and thermal management to electromagnetic interference compatibility to fault detection and protection. 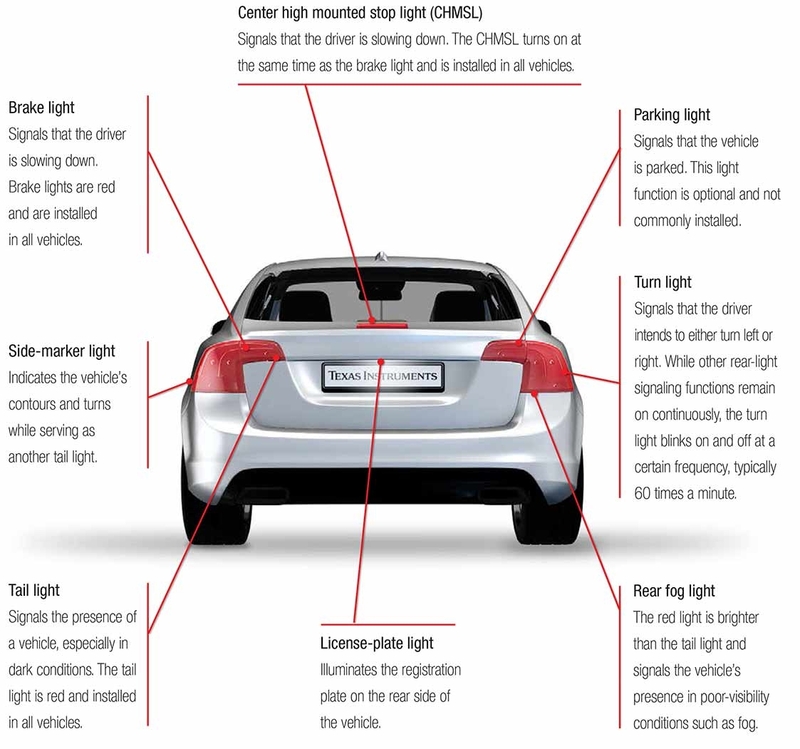 I recently wrote a white paper, LED drivers in automotive rear lighting, that discusses solutions to these challenges, as well as trends and topologies to consider in your next design. With the continued evolution of these systems, we can make the road a safer place for drivers and pedestrians alike. Get started on your design with TI’s interactive block diagram for exterior rear light systems. View TI’s interactive block diagram for digital interface LED driving module rear light systems. Review the automotive dual stage (SEPIC + Linear) static LED driver module reference design for rear lights. Review the EMC-compliant, automotive stop light and tail light reference design. Read about center high-mounted stop lamp designs on our blog.